The newly initiated devotees are disciples of His Divine Grace A.C. Bhaktivedanta Swami Prabhupad, the above eleven senior devotees acting as His representative. After the Temple President receives a letter from these representatives giving the spiritual name or the thread, he can perform the fire yajna in the temple as was being done before. 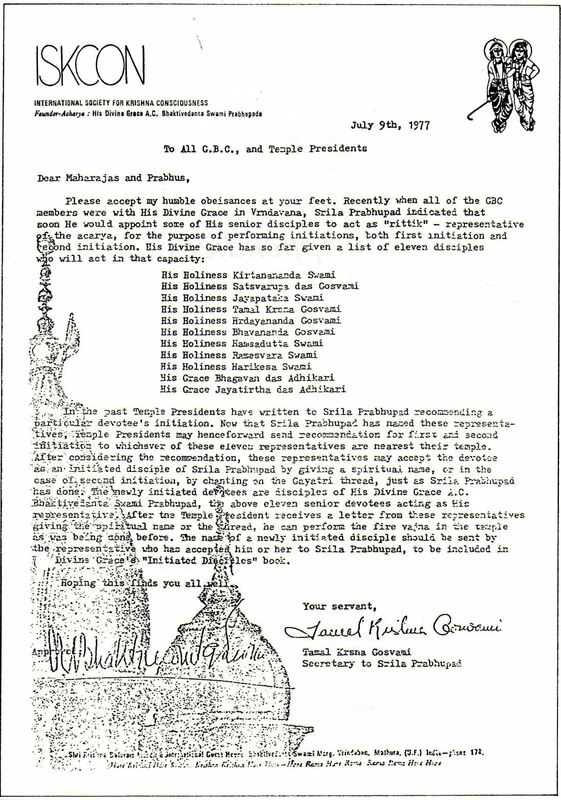 Srila Prabhupada's letter of July 9th, 1977 addressed to all temples presidents and GBC's is the final instruction on the subject of future initiations/gurus in ISKCON after Prabhupada leaves his body. Srila Prabhupada appointed some of His senior disciples disciples to act as ritvik representative of the acarya, for the purpose of performing initiations. be sent by the representative who has accepted him or her to Srila Prabhupada, to be included in His Divine Grace's "Initiated Disciples" book." Iskcon GBC Resolution 304 states: "Whereas the doctrine that Srila Prabhupada desired to continue to act as diksa-guru after his departure from this world, and did not desire any of his disciples to give diksa, or initiation, in succession after him is an errant philosophical deviation (known as ritvikism); and Whereas ritvikism directly contradicts the principle of parampara. 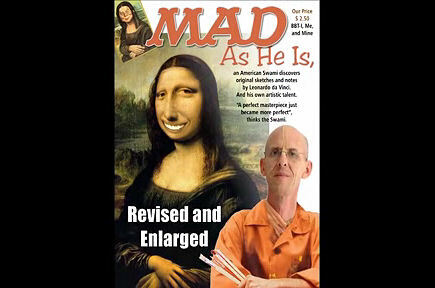 Is Srila Prabhupada a deviant "Ritvikist" ? No, Srila Prabhupada is the Guru of the whole Hare Krishna, Iskcon society. To call Him or his disciples, who follow his instructions, "Ritvikist" or "Ritvikvadis" is a great offence to Srila Prabhupada and his movement. These desig- nations (Ritvikist, Ritvikvadis) are concoctions of words, of those bogus gurus and devotees who are antagonistic against Srila Prabhupadas instruction to act as His ritvik representatives. "Since Srila Prabhupada Himself introduced the term "Ritvik", it is very offensive to Srila Prabhu- pada, to denounce His words. 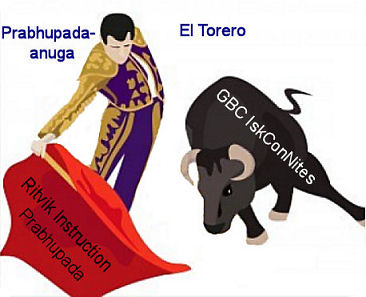 The attempt of Iskcon GBC to degrade the transcendental Vedic term "rtvijah" or "ritvik" to a derogatory word is one more example of offenses that have entered iskcon due to the neglect of Srila Prabhupada's instruction." Srila Prabhupada wrote a signed instruction on July 9th 1977 stipulating that all future initiations of those persons drawn to his teachings after his departure should be performed by ritvik initiators and that all who are initiated in this way would be considered his disciples under his personal guidance and protection. The other crucial direct and indirect instruction given by Srila Prabhupada is to avoid intimate association with those who would come forward after his departure and attempt to cut ones faith in his personal order and thus cut off ones real lifeline and connection to his eternal spiritual presence. We affirm that A.C. Bhaktividanta Swami Prabhupada is our Diksha and Shiksha guru by virtue of his personal order to become his disciple and be instructed by him through his books. We affirm that anyone who criticizes, or finds fault with this method of diksha by the order of the Acarya and shiksa by way of his books should be avoided and placed at a respectful distance from one trying to advance in spiritual life under his divine guidance. We affirm that only those who are to be worshiped and respected as perfected saints are those already listed by A.C. Bhaktivindanta Srila Prabhupada and unanimously agreed upon by the majority of vaishnava societies as genuine eternal associates. Srila Prabhupada: I will never die! I will live forever from my books and you will utilise. If I depart there is no cause for lamentation. I will always be with you through my books and orders. I will always remain with you in that way. Whether I am present or not does not matter. Srila Prabhupada: In my books the philosophy of Krishna Consciousness is explained fully so if there is anything you do not understand, then you simply have to read again and again. By reading daily the knowledge will be revealed to you and by this process your spiritual life will develop. Follow the Instruction, not the Body!